I have two friends who can’t eat gluten, one is simply gluten intolerant whereas the other is a celiac. 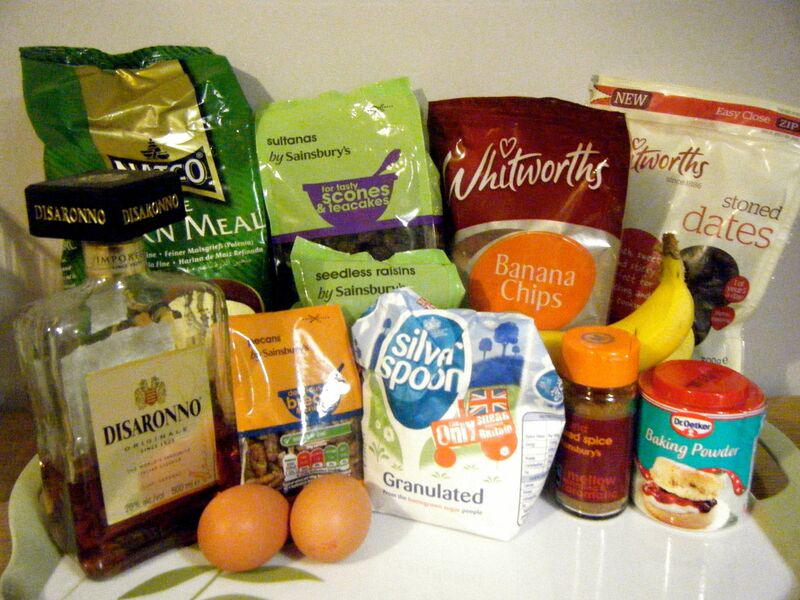 It’s therefore unsurprising that I have been give a couple of gluten free recipes to try throughout Challenge 52. 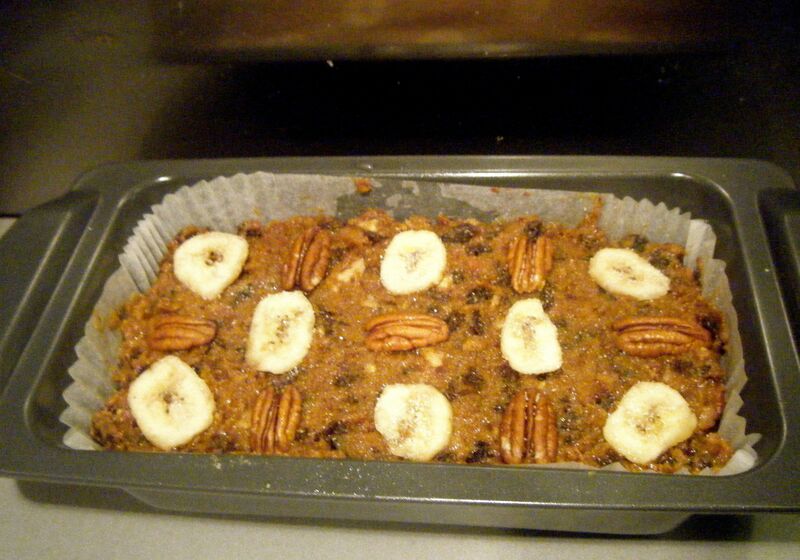 I thought I’d start with date, banana and rum loaf as suggested by my friend Chloe, who is gluten intolerant. 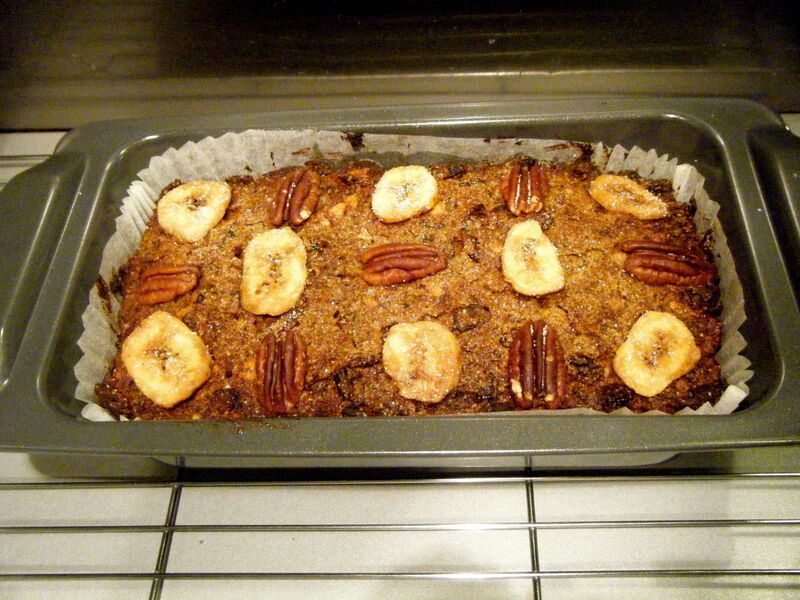 I did a quick google search for “gluten free date, banana and rum loaf” and it brought up a perfect recipe which ticked all the boxes. So I decided to use this one. I have to admit, despite having a couple of friends who can’t eat gluten, I’m quite ignorant about what this actually means for their diet. It’s a new world for me and I really didn’t and still don’t really understand what they can and cannot eat. I have learnt that gluten is protein found in wheat, and that it helps food to hold its shape. However, I’ve not managed to get my head round all the places gluten may be hiding. This recipe has given me a taste of what it would be like to be gluten intolerant and I must say I do not envy my friends! I took a look at the “free-from” section in a number of supermarkets and found all of them to be tiny. Whilst there is generally a selection of ready to eat gluten free food, I felt the range of ingredients available for making food from scratch was not very good at all. Plus everything had a ridiculous mark-up because it was gluten free. I thought I was onto a winner with this recipe as there appeared to be nothing which would be a special gluten free ingredient except the baking powder. My baking powder is already gluten free and I therefore thought it would be nice and easy to go ahead and make it. However once I had bought all my ingredients, I had a quick look at the comments on the recipe and found out that polenta is not always gluten free! I sent a picture of the pack I’d bought to my celiac friend and she confirmed she would not be able to eat it. So I popped into a supermarket the next day in search of a suitable product – they didn’t even sell polenta! That night I tried another supermarket and thankfully had success. However, there was only one gluten free option and the bag was huge! So anyway, I finally had all my ingredients ready and I got started. I put 200ml of boiling water into my pan and bought it up to a bubble. I then added the dates and set the timer for 5 minutes. 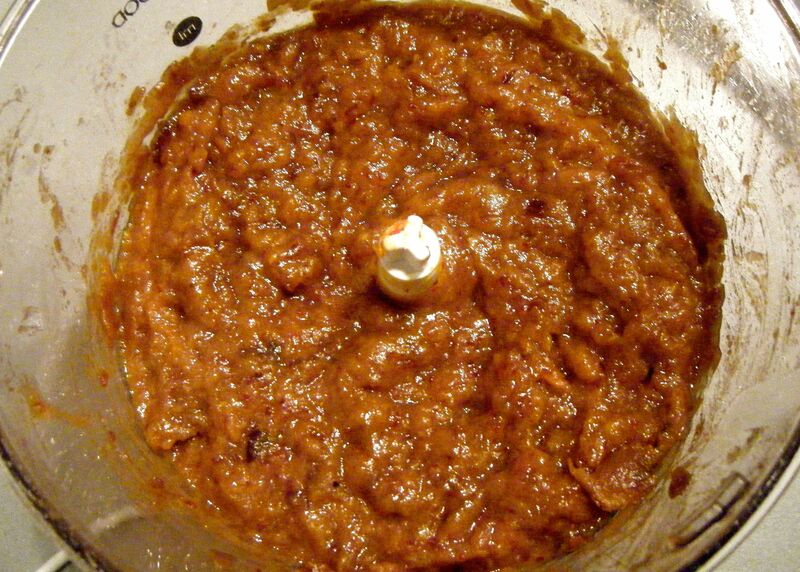 Whilst the dates were simmering, I broke up the banana and popped it into my food processor. Once the 5 minutes where up I drained the dates, being sure to reserve the liquid, which ended up being exactly 100ml! I was a bit concerned about adding the hot liquid to my blender and I therefore waited about 10 minutes for the dates and liquid to cool down. 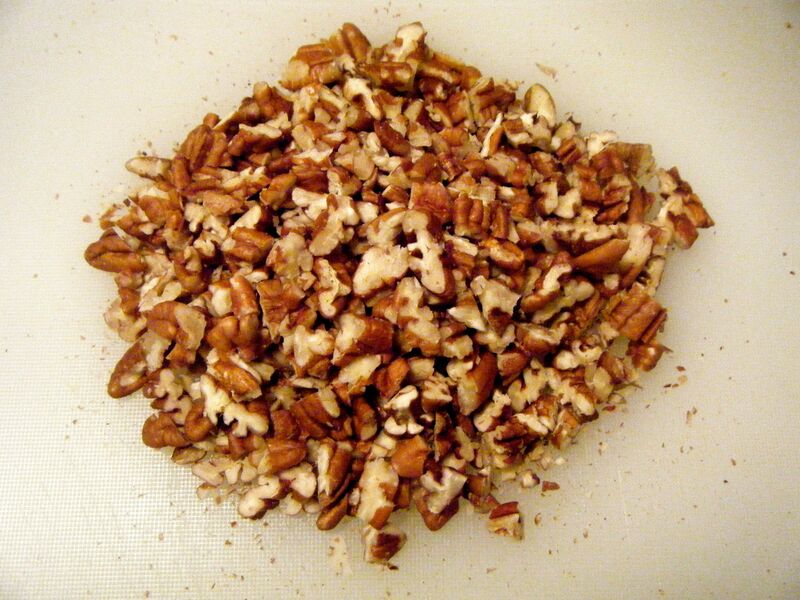 Whilst they were cooling, I chopped my pecans ready to be added to the other dry ingredients. I have a bit of a thing about textures and don’t like it when I have big crunchy nuts in a soft cake so I chopped the pecans quite small but this is just personal preference. 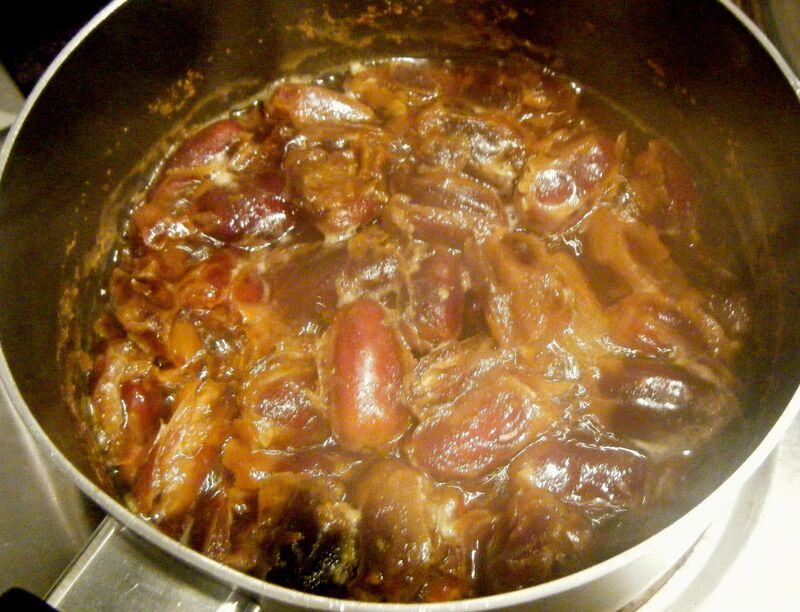 When the hot ingredients had cooled enough, I blitzed the dates, banana and liquid until smooth. I put all the dried ingredients into a big bowl and added the date/banana purée and the Disaronno. 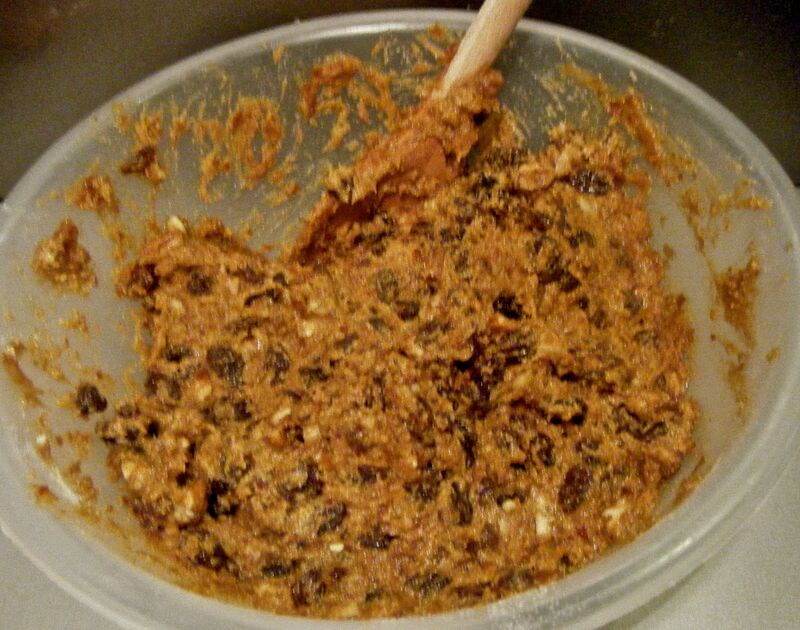 I then mixed it all together with a wooden spoon until well combined. 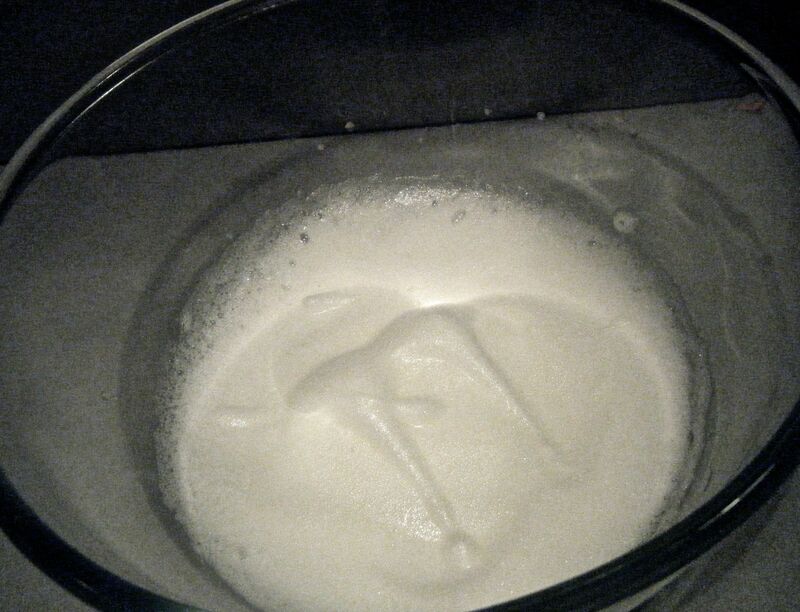 Next, I got out my glass bowl and electric hand whisk to prepare the egg whites. I beat them until soft peaks formed and then carefully folded the whites into the mix. Practical Tip: be careful not to knock the air out of the egg whites when stiring them into the mix. Cut down vertically into the centre of the mixture and fold the bottom of the mixture up and over the top of the egg whites. Turn the bowl and repeat this action. Fold slowly and carefully until the egg mix is combined. I added the finished mix to my lined tin and decorated the top with the dried bananas, left over pecans and a little bit of sugar. I popped the tin in the oven and set the timer for 30 minutes. When the timer went off, I re-set it for 15 minutes and then checked the loaf. At this point, I decided to cover the top with foil to stop it burning and left it in the oven for another 10 minutes. Finally it was done! I let the loaf cool in the tin for 10 minutes and then took it out, removed the lining and left it to cool on a cooling rack. The finished product made the rounds this week, a few slices were taken to work, a few to Cardiff and a sizeable chunk was given to my celiac friend. The verdict from everyone was that it was very nice, everyone that is except my other half. Dave doesn’t like fruit cake so I wasn’t that surprised. Personally, I thought it was lovely. It was so moist, full of flavour and best of all easy to make. I’ll be making this a few times, even if its just to use up the huge bag of polenta! This entry was posted in Challenge 52 and tagged Challenge52, Food, Gluten-free, Recipe, Sweets & Treats by MyGastroAdventure. Bookmark the permalink. Polenta can be used to make very nice orange and almond cake. It is easy and reliable cake with very few ingredients, just puree from cooked oranges, eggs, sugar, almond meal and polenta. You do not even have to use baking powder.